Thank you so much for this! We were contemplating using this very program for math this coming school year, but I was still in the research and pray part of my decision because of the cost. This will really help us make an informed choice! Thank you again. Amanda, my boys love it. 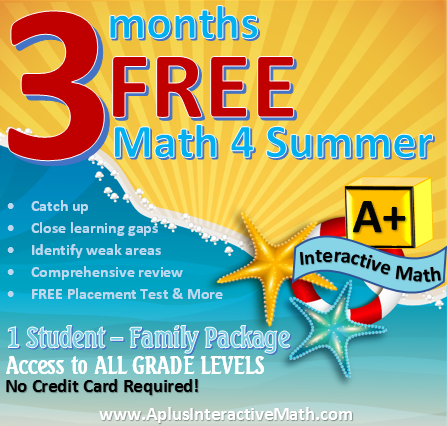 Right now you can get up to 90% off on the year of math for the Family Packages. Thank you!!! My girls are struggling with math and I was trying to find something to help. This is perfect!! Thank you again!!! I think it should be available for the next few weeks, but I can’t say for sure since the company didn’t give me an expiration date. You can get it today and activate any time before 12/31/2014. You will have 3 months from the day you activate it. Can it be used for two children? This free deal is for 1 student but we do offer 1 student to 10 student options for purchase. I cannot thank you enough for this!! My daughter is enrolled In public school, is in second grade and struggling hard. She excels at all subject levels except for math. I have been scouring the internet for a helpful course to tutor her, as I am not very good at teaching math myself. Once again, I cannot thank you enough and I feel blessed to be able to finally help and encourage her with math!! I tried this but the link to activate your account is invalid. “http://aplustutorsoft.com/ActivateYourOrder.do” is what pops up but doesn’t work… Help? I just checked and it works fine. Please try again and if you see issue with it, you can contact Support from their website. I just cheked and it works fine. Please try again and then contact Support from their website if you still need assistance. You need a “Flash” (from Adobe) compatible browser. You can download Puffin for iPAD for free (30 days) or purchase it for $2.99 for your iPad. Once you have a Flash compatible browser, it will work just fine. What about Android devices? Have an Asus tablet my son uses for most of his online schoolwork. If I download Puffin, will it work? Should be fine with Adroid as well. I will definitely be checking this out for my two boys this summer! Thanks for the info! It is not working for me, could you please let us know when you resolve it. Thanks. The website is up and fine now. Thank you for all your help….however, we tried to access the Kindergarten-level material, and it wasn’t listed as an option. It’s in the description, above—is it NOT available, after all? Our KG and 1st Grade is combined and that’s why we call it K1. You will find all the lessons that are taught in KG in the 1st grade as well. Please feel free to call us and I will be happy to explain further. yes, it worked me now. Thanks. Thank you so much! This will be awesome for helping prevent the slide we usually see at our house over the summer! All seems to working fine.